Combining power and portability! HP Elitebook Folio 9470m, HP’s first business Ultrabook with docking capabilities, is perfect for the mobile professional in expertly juggling meetings, presentations, document processing and multimedia viewing. Keeping them productive whatever the day brings, they get the mobility of an Ultrabook with the business functionality they demand. Coming with state-of-the-art 3rd Generation Intel Core i7 processors and a 4-cell battery pack and built-in power management features, the Folio 9470m lets results-driven users enjoy long hours1 of unplugged use. Offering less down-time without the hassles of constant charging, HP’s leading mobile innovation ensure they have more time to push for bigger achievements, from accomplishing rush client demands to attending to important appointments on the go. The HP Folio 9470m is a design beauty at only 18.95mm thick, making it the thinnest EliteBook from HP for style-savvy professionals. Its bright, glare-resistant high-resolution 14-inch LED displays digital content in the most vivid colors for an immersive viewing experience over long periods of time, from making high-priority reports to watching movie marathons. Spending long work hours becomes even more comfortable with the HP Folio 9470m’s backlit keyboard and easy-to-use accurate track pad. Coupled with an integrated dual-microphone system and the HP TrueVision HD2 Webcam, net-based video conferences are a breeze. Connecting to the rest of the world is also a fast and easy feat with the Folio 9470m’s outstanding support for wireless and wired internet communication. Packing WiFi and optional HP Mobile Broadband and 4G LTE3 capabilities as well as the standard Ethernet port, sharing one’s work becomes fast, reliable, and secure. Best of all, the Elitebook Folio 9470m comes in at only 1.63kg, making it a lightweight, ultra-portable solution that caters to every business and entertainment need. It’s a perfect combination of class and performance that’s ideal for the modern professional who’s always on the go. 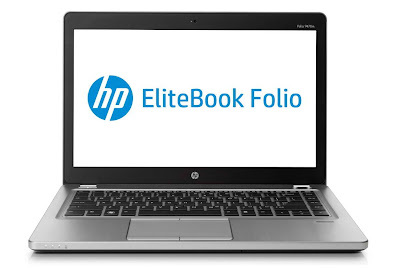 The HP Folio 9470m is now available via HP commercial resellers. The price of the HP Folio 9470m is yet to be announced. I’ll update this post as soon as I get more details about the HP Folio 9470m. So, stay tuned!